REPORTS of politicisation of aid for Cyclone Idai victims — which have mainly been emanating from the local opposition — were yesterday dismissed by the International Red Cross Society (IRCS), with its country director in Zimbabwe Mr Paolo Cernuschi saying everything was being done transparently. Mr Cernuschi made the remarks as more countries continued to provide assistance to Zimbabwe. The ruling Zanu-PF, which is accused of seeking political mileage and allegedly looting goods meant for the disaster survivors, also strongly refuted the claims yesterday. The opposition has been peddling false reports of alleged politicisation and looting of aid to scare away help and deepen the crisis. 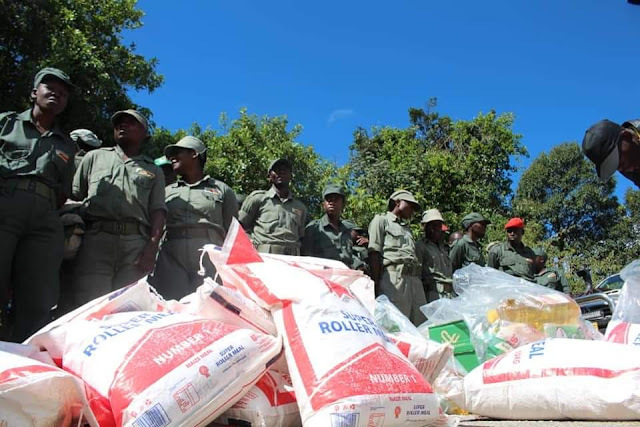 Zanu-PF spokesperson Cde Simon Khaya Moyo said aid distribution was being done in a transparent manner and that the ruling party was not manipulating processes. “The Ministry of Local Government, Public Works and National Housing, through the Civil Protection Department, is the one in charge, assisted by non-governmental organisations and the Department of Social Welfare. No political party is involved,” he told The Herald. He explained that Zanu-PF had volunteered some of its vehicles in the initial stages of rescue and relief efforts out of compassion. Ironically, the opposition had been criticising the ruling party for doing nothing only to turn around when the party offered its hand, and vehicles. But Cde Khaya Moyo said the party had no intention of meddling in the distribution, as it would fall into a trap. “We know what animals we are dealing with and we are avoiding any controversy and the machinery of distributing aid is intact and things are under control,” he said. The ruling party’s Youth League secretary, Cde Pupurai Togarepi, expressed anger at accusations that the party was allegedly looting aid meant for the hapless villagers. “Of course, such reports are grave and indeed of major concern, and as the Zanu-PF Youth League we would like to set the record straight and unequivocally state that our members are disciplined and would never loot from fellow countrymen stricken by a natural disaster of such calamitous proportions. “We are a party defined by ideology and thus we adhere steadfastly to the principles of Ubuntu that identify us as Zimbabweans and products of the liberation struggle when our freedom fighters lived among the masses executing the liberation struggle. “It is within such a prism that our members are currently helping affected families through the distribution of food and other essentials to affected families. Of course most of the vehicles being used are branded Zanu PF but the nation should rest assured that there is no partisan food distribution but rather a concerted effort by everyone including our youths to ensure that every resource available is channelled towards assisting those in need,” he said. He explained that the ruling party membership, including graduates from the National Youth Service, had risked life and limb rescuing fellow countrymen and recovering bodies of those who died when tragedy struck, most of them are members of Zanu PF and are leading by example in the rescue operations. “Their work is voluntary,” he emphasised. The opposition MDC Alliance has sought to politicise the disaster response to condemn Government hoping gain mileage out of it. At worst, observers say, the opposition wants to scare away goodwill. Happily, more aid continues to pour in from around the world with Switzerland through the Swiss Humanitarian Aid releasing US$2 million to help victims of Cyclone Idai in Zimbabwe, Mozambique and Malawi. The United Nations Development Programme in Zimbabwe (UNDP Zimbabwe) yesterday also announced US$500 000 aid in the early recovery of Cyclone Idai affected areas in Manicaland Province. The United States Agency for International Development said it had provided nearly US$4,1 million to Zimbabwe, Mozambique and Malawi. The Swiss funding will be used to restore safe drinking water and provide Swiss experts to UN agencies in the three affected countries. Out of the aid package, US$ 1 million will be used for Swiss Humanitarian Aid’s actions and the other half will be disbursed to various UN agencies responding to the effects of the disaster. So far, twelve tonnes of relief goods have already been shipped to the affected areas with the first team that responded to the disaster. The supplies consisted mainly of materials and tools for building shelter. A new consignment to the region will primarily consist of materials and equipment for restoring drinking water supplies, e.g. for cleaning wells. UNDP Zimbabwe announced today, half a million dollars to aid in the early recovery of Cyclone Idai affected areas in the Manicaland Province of Zimbabwe. UNDP will also support with specialist expertise in early recovery, drawing from its global pool of specialists who have experience dealing with disasters of a similar magnitude. The funds were availed through UNDP’s funding window, which, among other objectives, enables coordinated, flexible, and rapid responses to development needs and emergencies. UNDP said it appreciates the countries that contributed to this facility, most notably Denmark, Germany, Luxemburg, Norway, Portugal, Republic of Korea, Slovak Republic, Sweden and Switzerland. Government also received a huge consignments of solar lighting kits from a Chinese solar firm to be used in the cyclone Idai affected areas. The consignment donated by a Chinese company Yaowei Sola Zimbabwe was handed over to the Ministry of Public Service and Social Welfare for deployment in the Eastern Highlands. It was received by the Permanent Secretary in the Ministry of Public Service and Social Welfare Dr Judith Kateera on behalf of Minister Sekai Nzenza. The Ethiopian Community Association in Zimbabwe led by Dr Endris Seid and officials from the Ethiopian Embassy donated four tonnes of mealie meal. The consignment was received by Local Government, Public Works and National Housing permanent secretary Mr George Magosvongwe at Makombe Building yesterday. Botswana last night sent a consignment of goods that include food and cooking utensils. The goods which included mealie meal, conned beef, spoons, pots, plates and mugs were received by Local Government, Public Works and National Housing Deputy Minister, Jennifer Mhlanga and Botswana ambassador to Zimbabwe Lieutenant General(Rtd) Louis Fisher. Dep Min Mhlanga thanked Botswana president Mokgweetsi Masisi and the people of Botswana for the good gesture. “We thank you for a generous gift from the President of Botswana. On behalf of President Mnangagwa, the Ministry and the people of Zimbabwe, we are so grateful. We are happy that our relations continue to blossom. As a friend, brother and sister, you have come to intervene at the time we need you most. We were really short of the protein but you came with the right intervention. “What you have brought will go a long way in alleviating the affected people’s plight,” she said. Ambassador Fisher said Botswana and people of Botswana will stand side by side by their sisters and brothers in Zimbabwe.